As you all are probably aware, I am an avid reader of romance. I usually get into a nice groove and read a ton in a row. Sometimes I feel like I inundate you guys with romance reviews, so occasionally I try to review a ton of them at a time in mini-paragraph format. This is one of those times. I have to say, this series has been rather hit, miss, blah for me. Luckily this one was a hit. I highly enjoyed the main characters, and the secondary characters too actually. The plot was one that I have yet to have read in the 168 historical romance novels I have read since I started keeping track of such numbers. Alex, the hero, catches Ian, the heroine's brother, in bed with his fiance. He forces him to leave through the window, naked as a jay bird, and all of this happens in the prologue! Alex decides the best revenge would be to seduce his sister, Genevieve our heroine. The book went nowhere I expected. It was an awesome surprise at every turn. I love the chemistry between the couple too. So steamy! Do you need to read the other books in the series to enjoy this one? No, not really, though they do make a lot of references to the other happy couples. 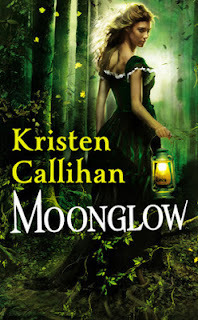 The second book in her series, Moonglow definitely met any criticisms I had had with Firelight (review) and did one better. I loved the romance between our leads! It felt very believable. The plot was alright, but really the strong improvement was in the more developed secondary characters and more interesting world building, since this book is a paranormal historical romance. Here we have the story of the sister of the heroine from Firelight, Daisy. Newly widowed from a horrible man, she is ready to "live it up." You may sat that she is even living it up too much when she is making out with a dude in an alley and a werewolf attacks. This unwittingly throws her under the protection of Ian. Both Ian and Daisy have secrets of their own but I love how they came together to not only overcome past pain, but to solve the mystery of the rogue werewolf. This is in a series, and I would probably recommend for full understanding amazingness to start with the first book before this. Oh, The Ugly Duchess. Why did you cause me so much angst? This book had a completely new plot for me that was executed well, but I couldn't help myself from wanting to die for the first third of the book. It just made my tummy hurt. I guess I should back up. Theodora and James grew up together, so much so that they never saw each other as romantic interests. 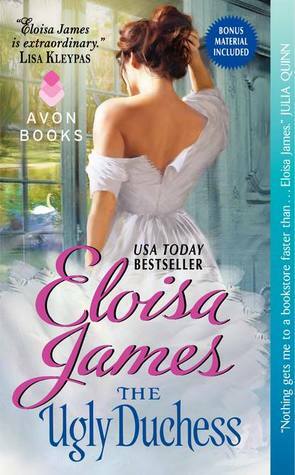 Until James has to marry her to save his father, and thus convince her that he actually loves her. And then while convincing her finds out he actually does. It sounds so convoluted when I tell it, but suffice it to say I was sick. My biggest problem, despite needing stock in Tums, was for a romance novel it seemed like they spent so much time apart! I did like the pirates though. And it was well executed technically. 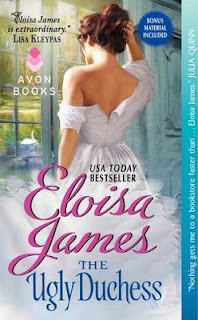 Eloisa James's Fairy Tale retellings are only connected by the fact that they are fairy tales, so you can read this stand alone of the moment moves you. I'm currently reading What I Did for a Duke... and LOVING it. The main characters are just so refreshing! And I'm already swooning and demanding they be together, even though I'm barely a third of the way in.